When it comes to my wardrobe, I stay away from polka dots just as I stay away from horizontal stripes. Those patterns are just unattractive on me. But when it comes to the bedroom, I can’t get enough of these prints. Whether it is a headboard, bedspread or on the walls, polka dot can be a fun and chic addition to a space. 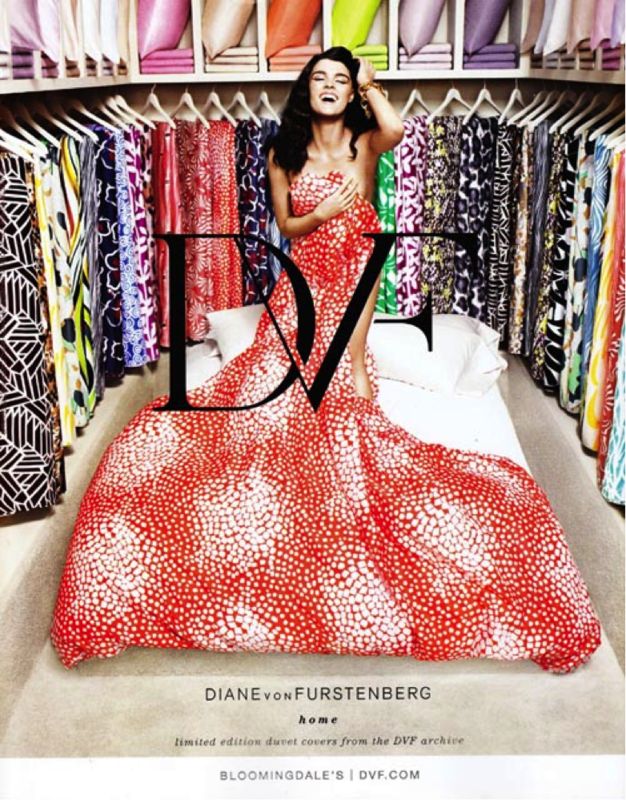 It appears spots and dots are also on Diane von Furstenberg’s mind. She has brought back an archived collection of DVF prints that her iconic wrap dress was once created with and transitioned it to duvet covers and sheets available through Bloomingdales. Instead of a closet of designer clothes, it’s a closet dedicated to luxury bed clothes. How many homes can claim to have such a room?! The colorful carousel of sheets is enough to bring about domestic bliss. All the prints would make me so happy, but in particular, the orange polka dot print featured in the ad fills me with euphoria. The dots are spaced equally and randomly to stylishly brighten any bedroom. Dots are a great way to add a little drama to the bedroom. And nothing exemplifies drama like Gossip Girl. Varying sizes and forms of dots accent the walls of Serena van der Woodsen’s bedroom on the Gossip Girl set. When it came to decorating Serena’s bedroom, Loren Weeks wanted the space to reflect the teen’s personality. “Her room shows a confident, eclectic mix of funky new and classic vintage items,” says Weeks, who decorated with bold patterns and metallic accents. “I wanted it to express her character: effortlessly beautiful and self-assured.” Golden polka dots prove they are well suited for the task as they add interest to a large blank wall. I love ikat as a design print even more than I love polka dots. Marry the two and a classic upholstered bed is transformed. 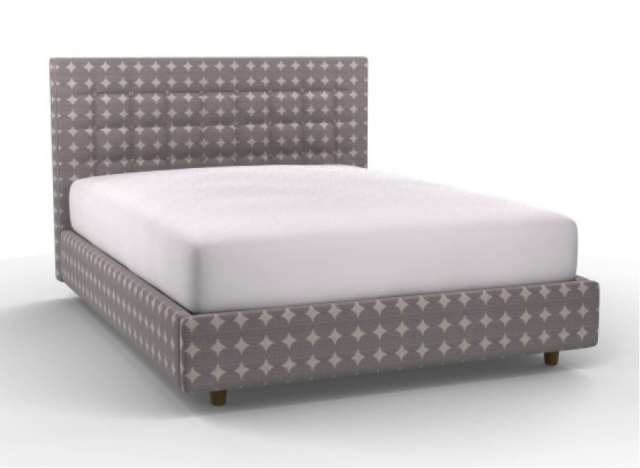 This is Dwell Studio’s Camden bed in Ikat Dotscape. Is it a pattern of starry ikats or are they repeating circles? Therein lays its beauty. It’s both! Today is the big day my boy turns four so in honor of the self-proclaimed “boss of the day” I will review a couple of his (but not necessarily my) favorite bedtime stories. 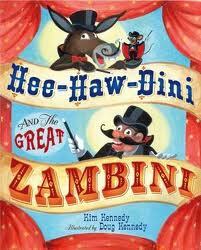 Hee-Haw-Dini and the Great Zambini by Kim Kennedy. So the story is fine and somewhat predictable: the donkey Hee-Haw and his mouse friend Chester love magic but the other farm animals don’t believe a simple donkey and mouse could possibly be magicians. Guess who gets shown up in the end? Yup, that cynical pig, the condescending rabbit and the grumpy goose. I simply do not like the name Hee-Haw and it hurts me to read that name aloud over and over. And I am required to read it over and over. And over. Trouble With Trolls by Jan Brett. I actually like this one. Jan Brett is a great illustrator. There is always a little side story going on in the margins of her illustrations. This one tells the story of a girl who encounters a bunch of pesky trolls who are trying to steal her dog. Capitalizing on their stupidity and greed, she convinces them to take all her belongings but saving her dog. The little picture story in the margin shows the underground world of the trolls and the daily routine of one sleepy hedgehog. It’s one cute little ‘hog. One of the biggest embarrassments I ever experienced as a child was believing that other people would be as interested in celebrating the birthday of my dog, Whiskers, as I was. In my mind, it was plainly obvious that my faithful companion was more than deserving of a celebration marking his fourth/twenty-eighth year; thus, I spent hours hand-crafting invitations for each person in my third-grade class (minus that smelly girly, Felicia, who had scabs all over her arms, sucked the liquid out of dandelion stems, and always wore too much rayon). Alas, however, even the promise of confections, canines, and Nintendo wasn’t enough to lure a single one of my so-called “friends” away from their Heathcliff and Inspector Gadget reruns. I was devastated; Whiskers nonplussed. We both ate a lot of cake. I was reminded of this massive mongrel mistake recently whilst watching the television show Drop Dead Diva. Though a program about a beautiful but vapid model that dies in a horrific car crash and is reincarnated as a brilliant but overweight lawyer might not initially appear to have much in common with the trials and tribulations of a boy and his birthday dog, similarities abound. Case in point: Neither the lawyer, Jane, nor Whiskers are able to find much love in a cold, cruel world that dismisses them as second-class citizens based upon their outward appearance. Point 2: Jane has a guardian angel that feeds her nuggets of advice while Whiskers was fed nuggets of chicken by his guardian angel, me! Point 3: Jane pines for her modeling days and beloved boyfriend, Grayson. Whiskers, on the other hand, pined for the rubber pork chops he had chewed up alongside several of my beloved Chewbacca action figures. It’s all just too uncanny! 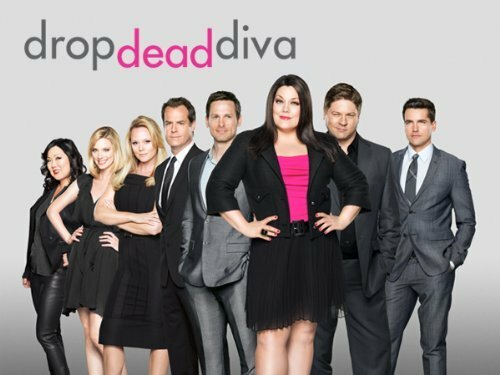 Drop Dead Diva is about as intellectual, thought provoking, and stimulating as its witty-by-way-of-secretaries-having-margarita-night-at-Chili’s-and-sloshily-coming-up-with-it title suggests. Like my dog’s deserted birthday party, it’s one of those programs that appears (and probably is) empty and sad, but is nonetheless filled with semi-delicious cake that you can gorge on when no one else is there to witness your rapid descent into self-pity. Sometimes, when you and your dog are dramatically ruminating over the meaning of friendship, a little junk food is the only guest you need. Masa harina, a Latin American dough made from hominy, gives these sweet corn cakes a smooth, full-bodied texture and distinctive flavor. Then, whole sweet corn kernels add little pops of pure maize when you dig in for a bite. These elements are especially nice when serving the corn cakes chilled, as we do here, then alluringly topped with smoky salmon and parslied sour cream. Wonderful for breakfast or brunch, but toss together a side salad and you’ve got a light, refreshing summer meal. Prepare the batter in advance and fry these babies up just like pancakes. Put them in the refrigerator to chill, or, if you want, stop right here and serve them warm with salted butter and Vermont maple syrup. Parslied sour cream appears elegant and time-consuming, yet it’s a cinch to whip up – simply toss all the ingredients in a blender and mix until smooth. It looks lovely, keeps well in the refrigerator, and its creamy herbal base adds fresh pizzazz (try it on baked potatoes, or even sandwiches). All you need is a little smoked salmon, for a super summery meal – a sweet and smoky breakfast in bed. Combine masa harina, flour, baking powder and salt in large bowl. In separate bowl, stir together milk, egg and honey. Gradually add milk mixture to dry ingredients, stirring frequently, until well-mixed. Fold in corn kernels and cayenne. Heat oil in heavy pan or griddle on burner over medium to medium high heat. Ladle ¼ cup of batter into pan for each corn cake. 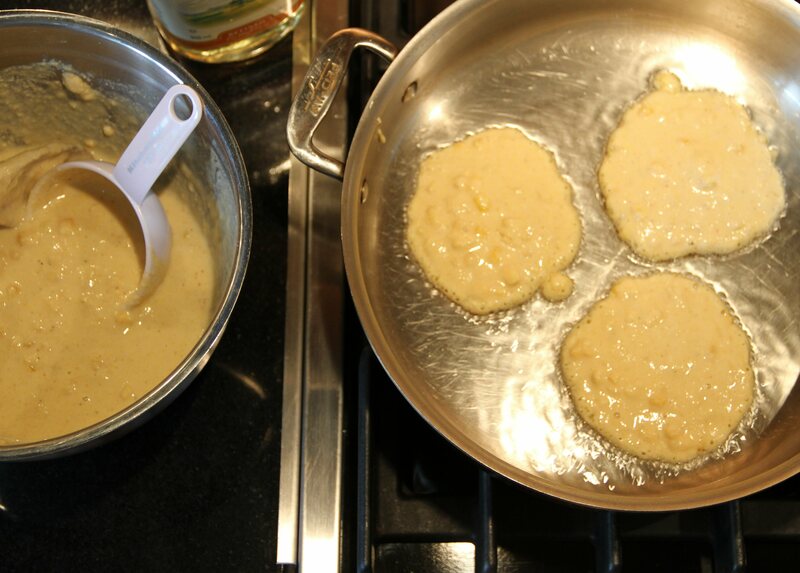 Cook one to two minutes per side, flipping once, until corn cakes are lightly browned and crisped. Add more oil and adjust heat as necessary. 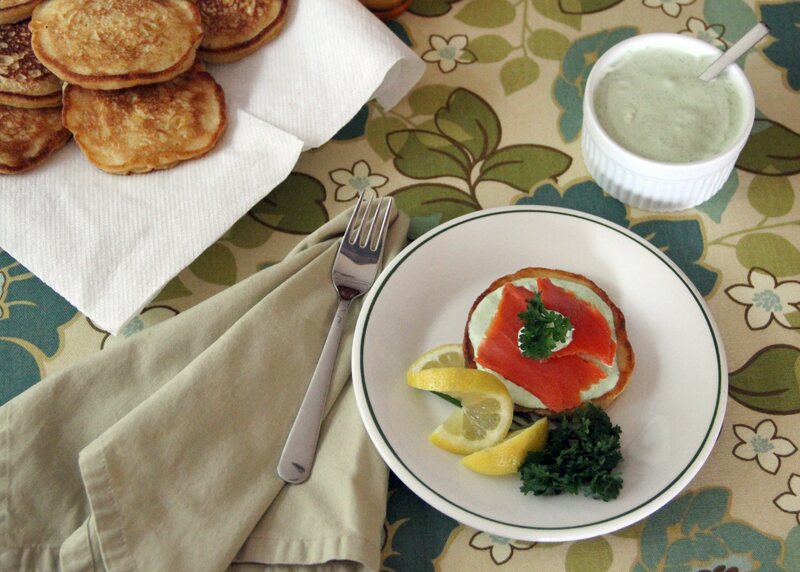 Serve hot with butter and real maple syrup, or chill and top with smoked salmon and parslied sour cream. 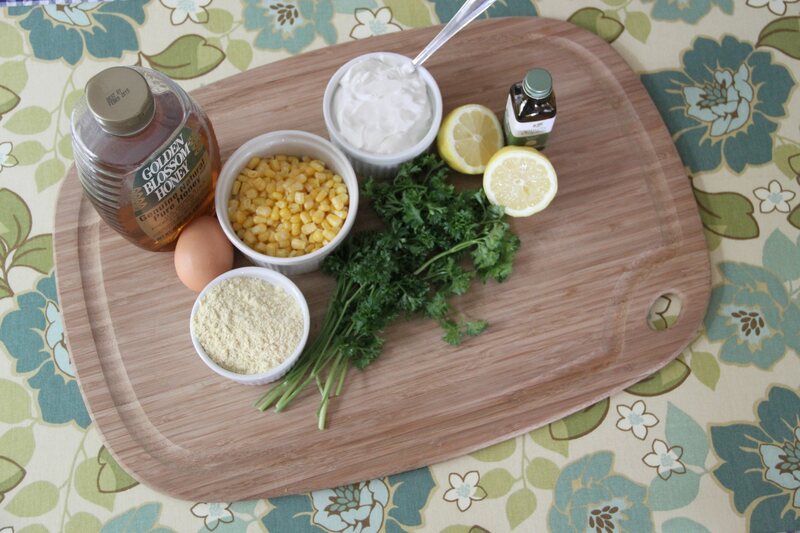 Makes approximately 10 sweet corn cakes. 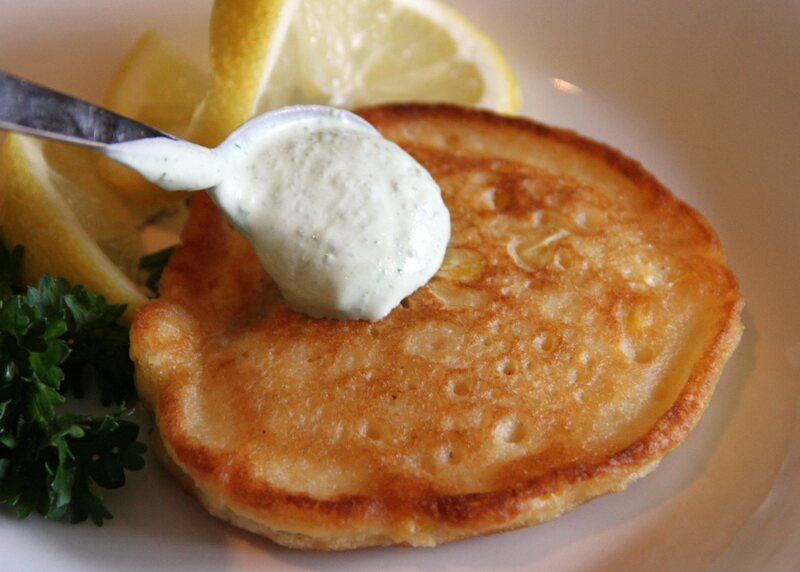 NOTE: For gluten-free corn cakes, replace the white flour with an equal amount of masa harina. Add all ingredients to blender or food processor and mix together until smooth. Store in the refrigerator until ready to use. Makes approximately one cup of parslied sour cream. Place corn cakes on plates. 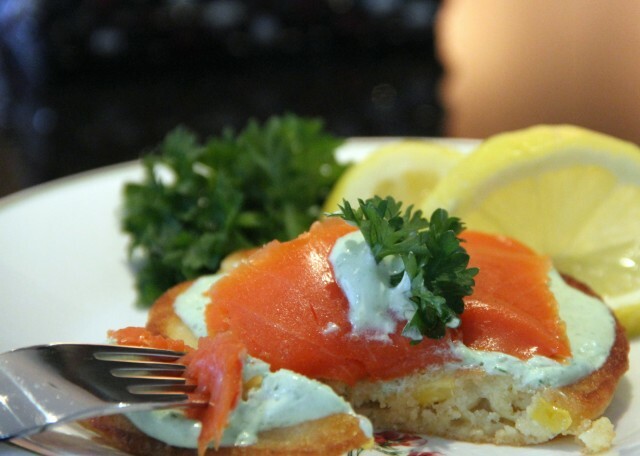 Spread about two teaspoonfuls of parslied sour cream on top of each cake, and top with smoked salmon. Garnish with a dot of sour cream and parsley sprig, if you like. I used to love Nick at Nite. I still do. And although Nick Jr. has now been the dominate channel in our household, one of my favorite shows is still I Dream of Jeannie. I can’t talk about I Dream of Jeannie without mentioning her bedroom. That was my favorite part, when the producers would flash from Major Nelson’s ordinary suburban home to Jeannie’s exotic and glamorous lair. Jeannie’s opulent bedroom is encased in wall to wall fabric and highlighted in opulent jewels. 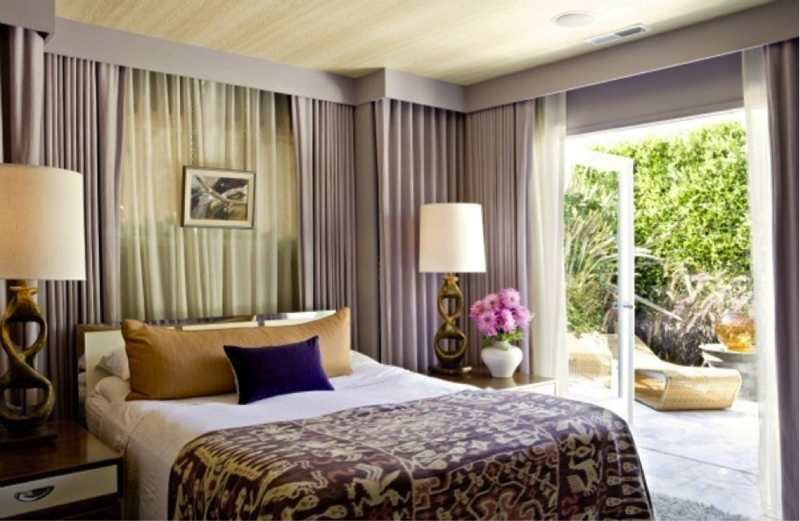 Fabric valences along a bedroom wall panel elicits the same magical effect that I get when I see Jeannie’s digs. Decorating the wall behind the headboard with sheers has a way of transforming the bedroom into a practical, enchanting retreat. I am in love with this soothing lilac and lavendar palette. It’s feminine, yet I could still convince my man to sleep in it without him feeling like I am undermining his masculinity. The gauzy sheers envelops the space. One wall of cascading sheers is all it takes to add dimension and a touch of romance. And it doesn’t hurt to have instant access to a tranquil garden patio right outside the bedroom. In the sunlight, the sheers are shimmering and brilliant. The bedroom above takes the cake, but treatments need not be extravagant to be wonderful. The bedroom below uses a basic curtain and rod panel and keeps the focus on the other elements in the room. The structured pattern of the window treatment and rug are offset by the casual crinkle effect of the simple textile behind the bed. 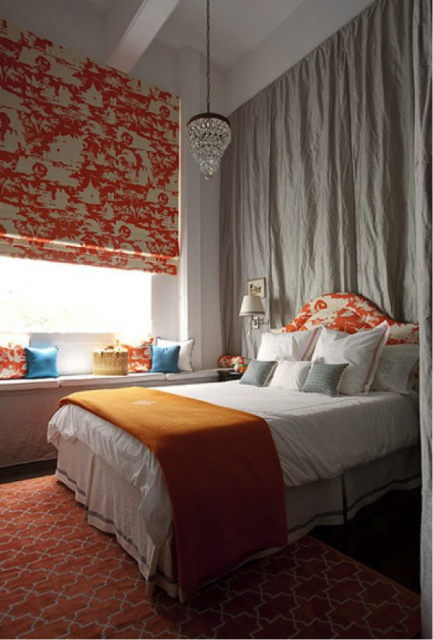 The similar lilac color creates a soft, soothing backdrop to the pop of orange. This particular panel has discreet slit openings, allowing the mounting hardware for the lamps and art to remain hidden from view. The panel color is neutral enough to be a wonderful alternative to white. And the design is easy enough that any DIY could accomplish. If bedrooms had names, this one would be named “Candy”, it’s that sweet. No amount of convincing could get my man in here, but there is something charming that draws me to it. The fabric panel behind the headboard that cocoons the space definitely has something to do with it. It enhances the room and gives a pure and innocent “genie in a bottle” effect. Pale pink might not be the first color that comes to mind when designing an adult bedroom. It’s definitely girly, but it’s also modern, sleek and chic.